A red-eye flight on Christmas Eve from California, a three-hour drive from the airport with a boat strapped to the top of the car, a giant hug from a friend she hadn’t seen in almost two years (but had the guts to come paddle with for a few days), and Giulia arrived for Christmas in Orange Beach, Alabama. I came in a few hours earlier from a half-dozen miles out with the sky dark and ready to burst, but the storm held off until I slipped into the Bear Point Marina next to a wild-looking boat covered in Christmas lights. Mike and Lori’s house on Christmas is like fireworks on the 4th of July, supernovas in the sky, parade confetti fluttering in the wind. It’s loud, it’s bright, it’s noisy. You’d need ear plugs if the sound weren’t pure joy. If you could bottle the place up, power plants would disappear and you could light city blocks. It’s kids and grand-kids music and dancing, ripped wrapping paper and torn packages. It’s tables turned into castles, bumped heads turned into tears that only grandma can stop, raised glasses and cheers. It’s trying on sequined mermaid tails, dancing on the porch, and people in and out of the house to say hello. It’s three generations of hugs and stories about a fourth, walkie-talkie conversations with a two-year-old, and a table filled with pies. It’s honey-baked ham in the oven topped with slices of home-grown pineapple. It’s bacon wrapped green beans and stuffing loaded with sage. 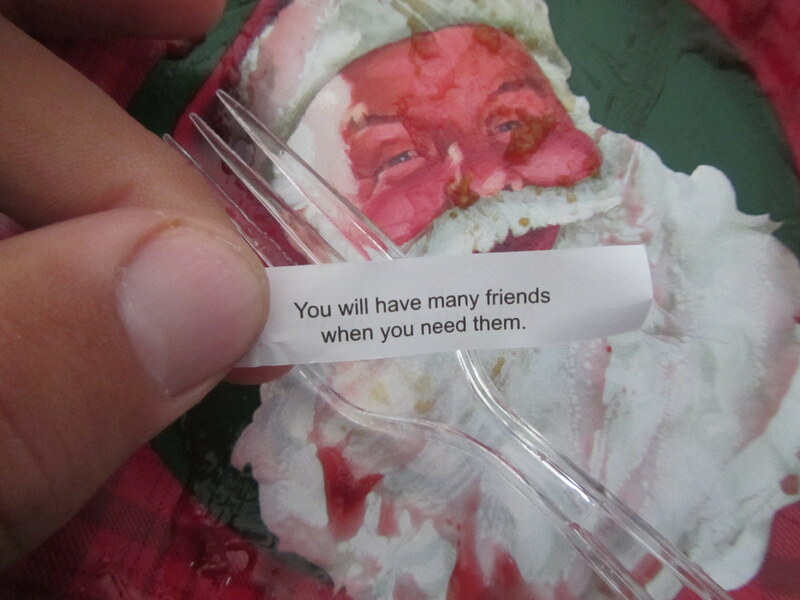 It’s a tin of fudge and a couple of fortune cookies left over from Chinese take-out a few nights earlier. It’s dolphins on everything–plates, shower curtains, blankets, even the pumpkin pie–and Lori’s story about becoming the Dolphin Queen when she looked out at the water and saw those beautiful animals playing in the bay. It’s Mike and Lori dancing in the kitchen like a pair of 17-year-olds in love, looking at each other in a way that gives anyone who’s ever had a broken heart hope. It’s their little terrier Mia who decided to live there one day and never left, even if it meant she couldn’t chase squirrels anymore. It’s a storm bending trees outside as two friends from law school–a girl from California and a boy from Tallahassee–found themselves in an Alabama house feeling less like strangers and more like family every moment. It’s like no Christmas I’ve ever had before, but then again, Santa used to bring me Legos and video games, not tall blondes from California and a Dolphin Queen. Posted in Angle to Key WestTagged alabama, Angle to Key West, christmas, dolphin queen, giulia, gulf of mexico, nice strangersBookmark the permalink. Superb Daniel. You captured it. Santa is starting to catch on. Good work ol’ man. I am looking forward to this story progressing. The tornado storm hit on the 27th, right? And on the 25th you are emersed in a warm, bright home. How does Daniel go from secure to exposed in two days? Does Giulia paddle through hell with you? Hold on foks, we will find out soon enough. Haha! The storm hit on the 25th. 😉 but Giulia and I do have a bit of fun with the wind in its wake! I wish I was Bill Murray and Christmas 2012 was my Groundhog Day. I want to live it over and over and over again. Lori & Mike & Mia & Family, thanks for being so fabulous, love you guys. If only I could have one more piece of that amazing pecan pie! It was so good! I don’t care if Lori says she didn’t have the right syrup, I would eat a whole one if I could! Awwww! Yep, Santa knows his business!! A big “Well Done & Thanks” to Mike and Lori. Go Santa, go! Yes, huge thanks to Mike and Lori! They are amazing people. “….looking at each other in a way that gives anyone who’s ever had a broken heart hope.” Love that! So glad you had a great Christmas (and New Year). Thanks, Jean! I can’t complain about the holiday season at it. It was perfect! Daniel, Giulia, so honored!! Mike and I have reread this so many times, and finally the tears held back enough I can comment! Your so complimentary, but in all truthfulness the honor was all ours! What a great gift you two gave our family by joining us!! I feel like I have two more kids now, for that I’m grateful! Our question to the two of you is.. CAN WE COUNT ON YALL FOR NEXT CHRISTMAS?? Because it won’t be the same if your not here! You gave our family a big gift! We were taking for granted just how special a family we have, thanks for opening our eyes…and BLESSINGS ABOUND FOR THE NEW YEAR! I hope so! 🙂 I gotta get back out there and learn some dance moves from you guys!